The prefecture of Heraklion is between Rethymno and Lasithi. It is the most densely populated prefecture in Crete and the one with the biggest financial development. It was the center of Minoan civilization, a fact that gave it international fame. 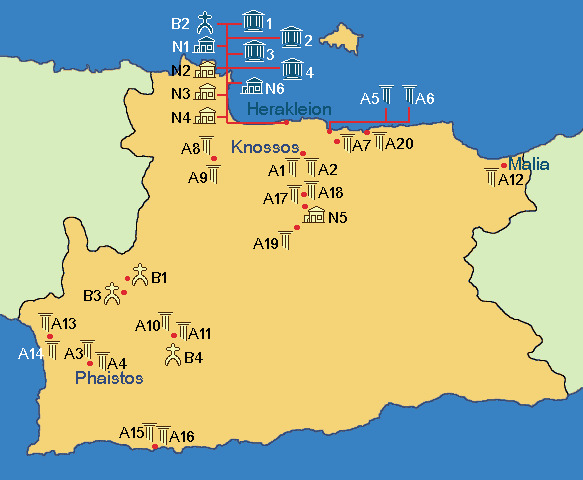 Here one can see the most important archaeological sites in Crete. Knossos, the legendary palace of Minoan, Festos and Mallia are the biggest and most impressive palaces of the ancient world. Heraklion, apart from the glorious history, is also praised for its incredible beauties. Beautiful beaches, divergence of landscapes, endless grounds of cultivating lands, compose a unique scenery. Tourist infrastructures are to be envied. In the tourist resorts all around the prefecture (Hersonisos, Mallia, Ammoudara, Agia Pelagia, Stalida, Tylisos, Kasteli, Tsoutsouros, etc) you will find big hotel complexes offering high quality services.